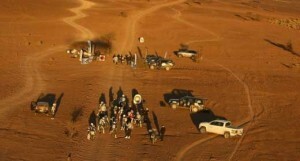 The second stage for the bikes and the first for the cars and lorries took the participants of the Sonangol Africa Eco Race from Boudnib to Tagounite, not far from Mahmid, by passing the famous Merzouga dunes. A Special of 409 km that allowed Italian rider Stefano TURCHI to pull out his lead in the overall classment and Jean Louis SCHLESSER to take control. Saturday night, the briefing was held around a huge camp fire, a good idea when the temperature drops to zero degrees. René METGE announced a varied Special stage that would require a high level of driving skills, especially in the Erg of Merzouga, but also require navigation skills. Like always, the race director knew what he was talking about and the stage lived up to expectations. On two wheels, after the short first Special to get them into the swing of things that hadn’t allowed anyone to pull out a significant gap, the second day promised to be more selective. The Italian Stefano TURCHI, World Champion of the all terrain rally in the 450 catagory but engaged this time on a KTM 690, won the stage after giving his rivals a lesson in riding and navigation. He came back to camp 20 minutes ahead of his closest competitor Martin FONTYN. The Belgian rider was on fire and if he hadn’t suffered a broken spark plug during the stage that made him loose 30 minutes, FONTYN would have won as he had overtaken TURCHI when he broke down. Behind, a gap immerged between the two leaders and the rest of the pack as Alfredo PROCACCINI finished 43 minutes after them. Dutchman Guillaume MARTENS was 47 minutes behind and the first Frenchman Christophe CONREAU, finished 5th 47’52’’ afterwards. The biggest disappointment of the day was from Norbert DUBOIS who lost almost an hour. 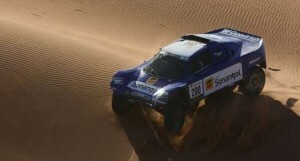 Even though the race is only just starting, the road to Dakar is long and the Parisian will have to pull his socks up. Even though he’s lying in 5th overall he’s already 1h16’ from TURCHI. There was a well deserved 4th place from Patrick ARNOULT, the only HONDA against a hoard of KTM’s in the 450 class. It was a difficult day for the quad riders including Emma CLAIR who fell at the beginning of the Special and suffered damage to her ribs. The director of NPO was taken to hospital and will finally be taken back to France for treatment. Her adversary Stefano DALLA VALLE also had a hard day suffering technical damage. At least we can say that the car class was animated today. Again, handicapped by the fact that he was first to take to the road, Jean Louis SCHLESSER was still the only driver not to make any mistakes. 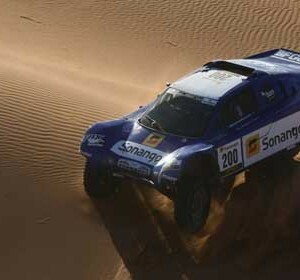 Exceptional in Merzouga, the gap was however cut down by Jérôme PELICHET thanks to SCHLESSER getting stuck in the sand. 4 time winner of the race, SCHLESSER was able to come back towards the end of the stage. He eventually gained a 5 minute lead over the TOYOTA pick up and the SONANGOL buggy crossed the finish line first. An excellent result that reminds us of the exceptional talent of this driver but we should also remember that his rivals are also very strong this year… There’s Belgian Joost VAN CAUWENBERGE, who finished in third place 18 minutes behind and who was followed very closely by Miroslav ZAPLETAL in his HUMMER. A final word for Jacky LOOMANS who had a difficult day, getting stuck in the sand and suffering a puncture. He finished 29 minutes behind the leader. In the truck class, the fight was on between these monsters of the desert. 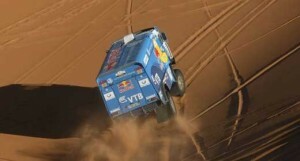 By taking the 6th time on scratch, at the wheel of his KAMAZ, the Russian Anton SHIBALOV looked strong. Meanwhile, Elisabete JACINTO, clocked the 7th best time of the day, finishing only 10 minuted behind the Russian. In third place we found the Hungarian Niklos KOVACS with his SCANIA who was 30 minutes behind and the TATRA of Tomas TOMECEK almost an hour. Monday 31st December will have a very tiring Special of 432 km that will take participants of the Sonangol Africa Eco Race to Icht, then onto the camp at Oued Draa after a liaison of 92 km. It’s not certain that everyone will be there in time to party for the New Year!